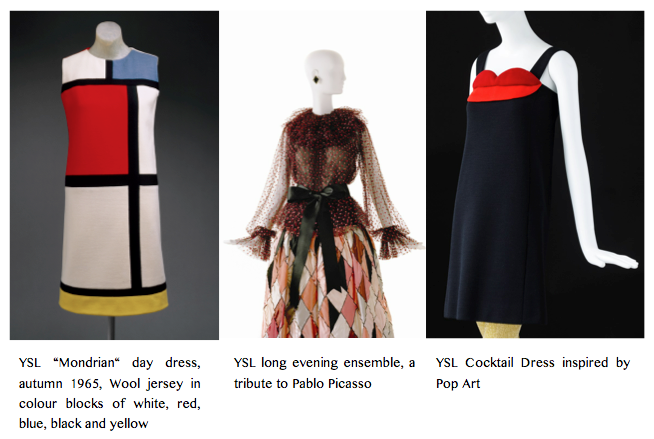 YSL’s fashion built a significant relationship to art, particularly through the homage collections to Mondrian and Serge Poliakoff (1965), later to Picasso (1979). 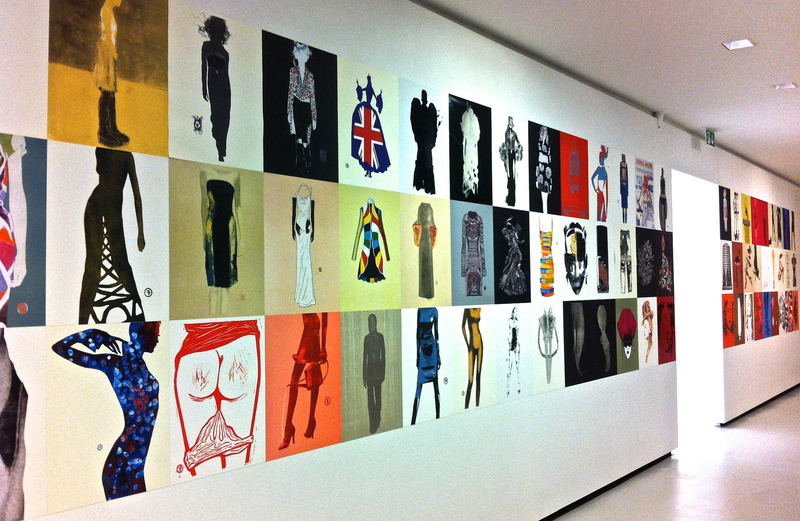 The Mondrian print “block[ed] out the new proportions“, unveiling much more leg. Picasso and cubism represented “the permanence of classicism and breath-taking imagination“. Willing to dress the bodies “that would ascend the barricades in 1968“, Saint Laurent also found inspiration in Pop Art movements. 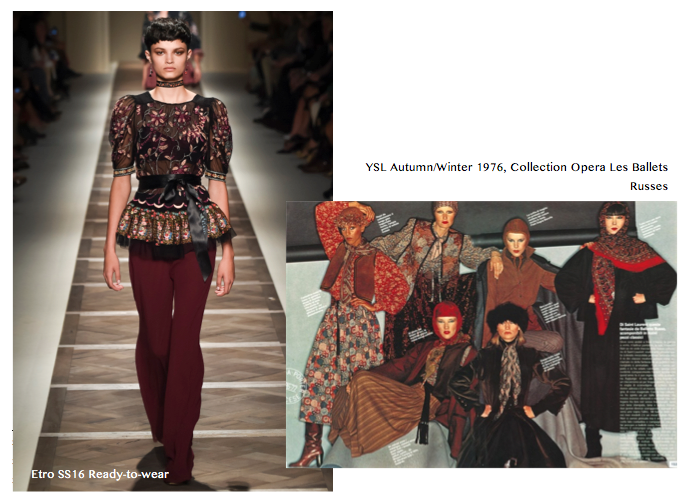 Even if the period following the Neo-plasticism and Pop Art years did not have their “spectacular intensity“, according to the American press and buyers, YSL’s ‘Opera Les Ballets Russes’ Autumn/Winter 1976 couture collection was a revolution. Inspired by Diaghilev’s ‘Les Ballets Russes’, it exploded “of expressionist, bright colors and voluptuous curves“, while paying a profound attention to detail, leaving behind the thin lines and pale nuances of neoclassical figures. 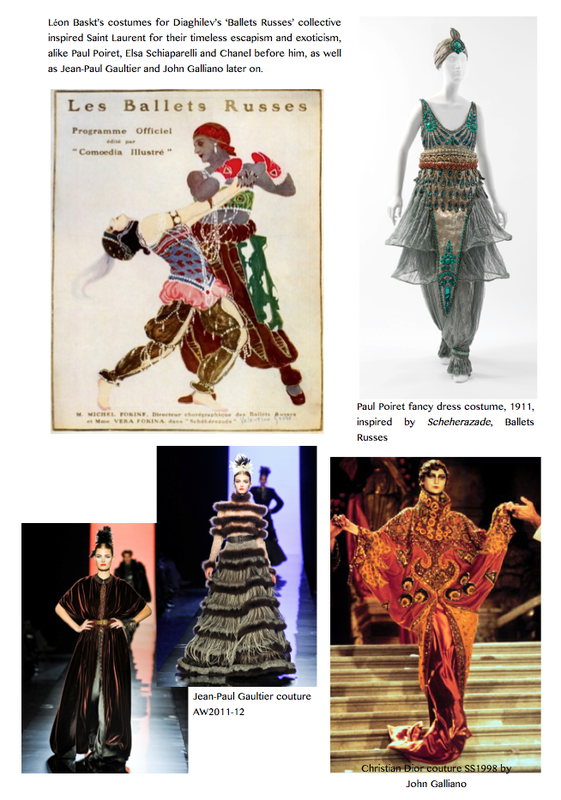 As an Avant-garde “art form“ rather than a proper art movement, Diaghilev’s artistic collective originated, firstly in couture, the 20th century fashion. 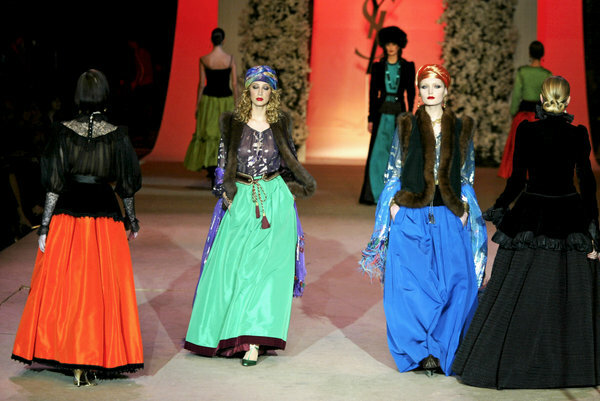 La Belle Epoque belonging to History, theatre inspired fashion announced modernism by creating living pieces of art. Costumes appeared in the fashion world, subtlety unifying the sublime and grotesque of a society about to live the roaring ‘20s, follow-up to the First World War. 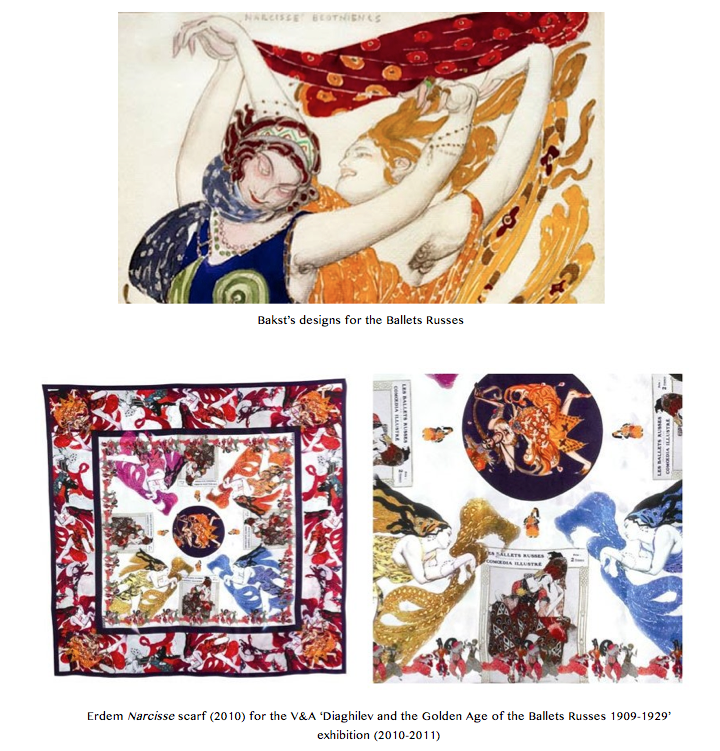 Bakst’s use of colour and new materials still have an impact on current fashion brands, such as Erdem (2010) who designed a scarf inspired by the Ballets Russes’s patterns, and more recently Etro (2015). Since Paul Poiret, fashion designers have been seeking creative collaborations with artists. 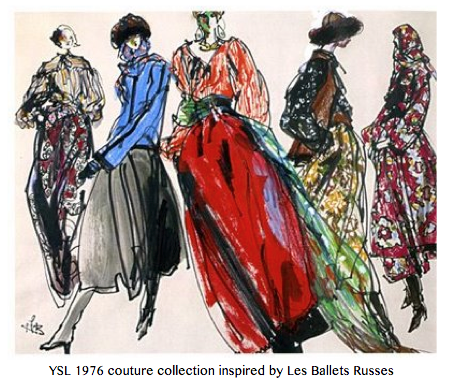 By the 1990s, the dialogue between art and fashion continued that ‘Les Ballets Russes’ had already started: to loosen the distinction between high and low culture. Fashion ever appealed by the prestige of fine arts, art realized fashion’s provocative aura, therefore started to consider it as a central concern from the 20th century on.